Life hasn’t changed much for Michael Comras since the Miami Beach-based commercial real estate developer, investor and broker closed the $370 million sale of an entire block on Lincoln Road to Spanish billionaire Amancio Ortega, whose fashion empire includes Zara. Comras and his joint-venture partner Jonathan Fryd had assembled the properties 18 years ago for about $12 million, later redeveloping them and securing leases with tenants such as Apple, Nike, Gap, Intermix and Athleta. The September 2015 sale to Ortega ranked as Miami-Dade County’s biggest deal of the year. 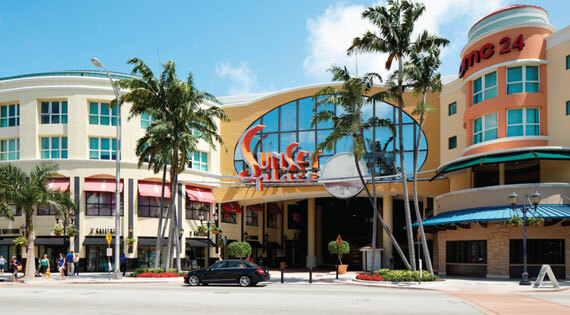 The original offering for 1001-1035 Lincoln Road had drawn about 10 bids, including some from ultra-high-net-worth families, state pension funds, a Middle East sovereign wealth fund, a Canadian pension fund and U.S. investment advisers, said Manny de Zarraga, an executive managing director at HFF and the lead broker on the sale. “There is no other property, definitely in South Florida, that has the drivers of pedestrian traffic, with all the hotels and residential areas anchoring the ends of Lincoln Road,” de Zarraga said of the buildings. He cited Comras’ and Fryd’s patience in leasing and their “carefully curated approach” in bringing together a compatible group of tenants as key components in the sale. “We created a world-class asset for one of the world’s wealthiest men,” Comras, the president and chief executive officer of the Comras Company, told The Real Deal in March, seated in his office in Miami Beach. The New York native recounted his efforts to find new tenants for the retail strip after Williams-Sonoma’s and Pottery Barn’s 15-year, lower-rate leases expired. Yet, while the high-profile sale may have catapulted Comras to the highest ranks of South Florida’s commercial real estate market, it has done little to change his lifestyle. Pressed for changes, he called out to his executive assistant: “Vanessa, has anything in my life changed?” “No,” she answered. In the months since the sale, Comras, 54, has managed to avoid purchasing a new car, a new home (three years ago he bought a waterfront house on the Venetian Islands of Miami Beach, where he lives with his longtime girlfriend) or even a vacation retreat. In fact, the real estate executive does not own a second home. Though he loves to travel, especially to Colorado, he prefers to stay “in a great hotel and be treated like a king,” he noted. He also continues to work just as many hours, in what he calls a “24-7 business.” Last May, the Comras Company partnered with Federal Realty Investment Trust and Grass River Property to purchase a majority interest in the retail complex CocoWalk for $87.5 million, and in late September, an 85 percent interest in the Shops at Sunset Place, in a $110 million deal. The investors are aiming to redevelop, re-merchandise and bring new life to the two tired shopping centers located in demographically key markets. “CocoWalk and Sunset Place need to create an environment that gets people out of their homes to shop, eat and meet their lifestyle needs,” Comras said. “Otherwise, they will sit at home and order everything online.” He said he would like to bring plans to the market in the next several months for both projects. Comras’ focus is squarely on urban retail, and he doesn’t do big box stores. His overarching aim is to “create a lifestyle and a sense of place with the right mix of tenants,” he said. That formula worked in Midtown Miami. After Comras brought in Sugarcane Raw Bar Grill, the corridor became a popular restaurant row. Now he is bringing that philosophy to the edge of Midtown, where he is leasing the new development District 36, which Comras envisions as a connector between the Design District and Midtown. He is even working with the Miami Parking Authority to design new underpasses that would invite pedestrians by offering a glimpse of a restaurant as they exit. “All I think about is creating places that people want to be,” he said. As Miami becomes increasingly dense, the city is also becoming more localized, said Comras, who lives less than five minutes by car from his Sunset Harbour office (eight minutes if the bridge is up for a boat to pass). “I live, work and play here. If I go dinner, I go to Sunset Harbour,” he said. “I love to be able to do that.” Comras added that he sees that need for a hyper-local commercial area in Coconut Grove, where residents can shop, eat and exercise. Growing up on Long Island and later living in Manhattan, the seasoned real estate executive honed his sense of what works to create a neighborhood that attracts people for strolling, shopping and sitting down with a cappuccino at an outdoor cafe. “There are experiences that stay with you and you carry with you,” he noted. Even when he is traveling, Comras said he is always looking at new retail concepts and analyzing how neighborhoods become ignited by shops and restaurants. “I’m like a kid in a candy store when I go to any city,” he said. HFF’s de Zarraga, who has known Comras for 25 years — since he worked with Comras’ grandfather at Sonnenblick-Goldman in New York — cited the developer’s deep knowledge of the retail real estate market. “He has an exceptional grasp of what tenants want, and that is extremely helpful and helps create a lot of value,” de Zarraga said. Comras graduated from the University of Miami in 1983 and then worked in Manhattan for Williams Real Estate Company, a firm that focused on the commercial office and retail markets, for 10 years while earning his M.B.A. at Pace University. He moved back to Miami in 1993, when he was 31, following the birth of his first child — the eldest of three children from a former relationship — because he didn’t want to push a stroller around Manhattan. Though he didn’t have a job at the time, Comras said he knew he wanted a better lifestyle. When he lived in Manhattan in the early ‘80s, he had noticed that wherever Gap opened, the area became hot. So he figured that if he could find a place for the Gap in South Beach and then buy additional buildings in the area, it would become valuable retail space. Comras ended up bringing a Gap store to Collins Avenue and 7th Street in mid-1994 and eventually Diesel, Sephora, Club Monaco and other high-end retailers, leading to the development of the Collins Avenue Fashion District. “This business is all about connecting dots,” he said. He also acquired 826 Collins Avenue and redeveloped it to house a Levi’s Store. He created a third-floor loft with a rooftop pool, where he lived for several years before buying his home. Today, representing landlords and tenants is still the mainstay of the Comras Company’s work. He and his staff of 10 brokers, including, most recently, his girlfriend of more than a decade, jewelry designer Daniela Swaebe — handle leasing throughout Miami-Dade County. That includes projects in Wynwood, Midtown Miami, the Design District, Brickell, Coral Gables, Aventura and Doral — as well as in Broward and Palm Beach counties. When it comes to retail, he is cognizant of the challenges posed by online shopping. “What we need to be mindful of is this online business and embracing it rather than being afraid of it, and to understand what it means to the consumer and offer them something they can’t get online — an experience,” he said. Comras still spends about half his time acquiring and developing commercial property. Among his projects is redeveloping the former Gardner’s Market shopping center on South Dixie Highway in south Miami-Dade. His holdings also include properties in Wynwood, the Design District, Midtown Miami, MiMo, Coconut Grove and Miami Beach. He still holds investments in property on Lincoln Road, including 744 Lincoln, primarily occupied by BCBG, and 701 Lincoln, leased to Forever 21 and a Peter Lik gallery. Comras has no plans to sell those assets, he said. Yet not all his deals on Lincoln Road have panned out smoothly. In October 2012, he had a deal to buy 940 Lincoln and 947 Lincoln in partnership with the Cayre family of New York, including Robert Cayre and his uncle Harry Adjami. That attempted purchase has led to years of litigation that is still ongoing. Nearby, Comras Company also represents Vornado Realty Trust, which owns the 1100 Lincoln Road building. Comras and his team of brokers are working on splitting up what is now Anthropologie’s space into four bays, to bring in new tenants when the store moves to a new building under development at 801 Lincoln Road. Throughout Comras’ career, matching tenants with retail space has not always proven to be an easy proposition. He has grappled with issues related to merging contemporary retail with historic preservation in Miami Beach. “There’s a constant battle to reach a compromise, working together with the city to find a happy medium,” he said. It took him several years to get the Apple lease deal approved. “I worked on three different buildings with Apple before I finally got the new location nailed down,” Comras said, noting that he had wrangled with the city of Miami Beach over the design of a building, “which nearly killed the deal,” and forced him to find a different site. Even some who have litigated against him say they respect him, like Miami Beach landowner Sam Herzberg, who began buying property along Lincoln Road in the late 1990s, about the same time as Comras. “Michael is a very bright, hard-working individual, and he deserves all the success he has,” Herzberg said.